The think-cell Elements menu is inactive ("greyed out"). I cannot insert any think-cell elements. The Elements menu is only active if a slide can be edited, i.e., in PowerPoint's Normal and Outline presentation views. Slides cannot be edited if no presentation is open as well as in an open presentation's Slide Sorter or Notes Page views, and therefore think-cell's menu is inactive. 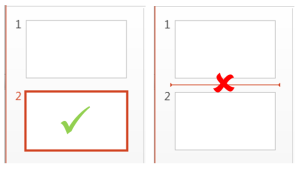 Switch to Normal or Outline views, either using the button in PowerPoint's status bar or by double-clicking the slide you want to edit in the Slide Sorter view. think-cell's menu should now become enabled. Note: A slide thumbnail must be selected if the Thumbnails pane is open in Normal view. In some cases PowerPoint prohibits editing of a slide, e.g., if PowerPoint was started in Safe mode or your license has been expired. Defective third-party add-ins can prevent the activation of think-cell's Elements menu because Microsoft Office does not isolate individual add-ins from each other. The problem may be caused by Acer's abDocs add-in, which comes preinstalled on some Acer computer models as part of the Acer BYOC Apps (abApps) suite. At least with certain versions of abDocs installed and activated, think-cell no longer receives PowerPoint's application events. You may want to try if updating abDocs resolves the issue. If you want to use think-cell together with abDocs and updating abDocs does not help, please contact the Acer support and open a service ticket with them. Our experience shows that vendors often do not act if we contact them directly, as we are not their customers. Please pass on our contact data and tell them that we are happy to provide a more detailed explanation of the issue as well as a test version of think-cell. The problem may be caused by Smart Technologies's SMART Board add-in, which is installed with the SMART Product Drivers. Several customers reported it for SMART Product Drivers up to version 10.8.118.0. In our tests, the problem could not be reproduced with SMART Product Drivers version 12.6. If you want to use think-cell together with SMART Board, please update the SMART Product Drivers to the current version. If this does not help, please contact Smart Technologies and open a service ticket with them. Our experience shows that vendors often do not act if we contact them directly, as we are not their customers. Please pass on our contact data and tell them that we are happy to provide a more detailed explanation of the issue as well as a test version of think-cell. The problem may be caused by still having Microsoft's Office Genuine Advantage add-in installed and activated. As Microsoft explains, the Office Genuine Advantage program has been retired. The latest Microsoft Genuine Advantage Software works online without an Office add-in. You can disable the outdated add-in without any concern. Find the add-in by following the instructions on how to use tcdiag.exe in KB0091: How to find out which add-in causes a problem. Disable the add-in in tcdiag.exe. Ensure to clear the checkbox Restore original activation in order to make the change permanent. If the problem cannot be resolved by the above suggestions, please contact our support team.